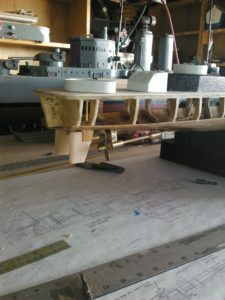 In our transitions from one web provider to another, many of the early construction photos of the USS Gearing were misplaced and are still… lost somewhere. Once found they will be added to this page. Here is a photo of the un-sheeted stern area, showing the twin rudders and shafts. 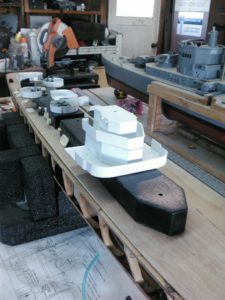 You can also see some of the styrene and ABS plastic superstructure parts on the deck. 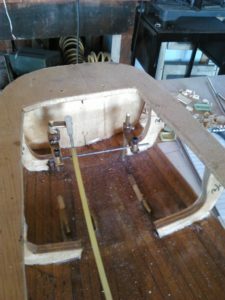 Here is a photo of the simple twin rudder setup, using a control rod connected to the servo in a watertight radio box. 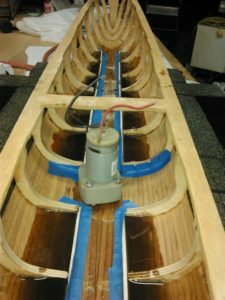 Other methods for setting up the rudders is to mount a waterproof servo, connected directly to the rudders, or with use of a combination of gears on the rudder posts. The gears can then be connected directly to the servo with a drive gear mounted on it or with a control rod back to a watertight box. All methods work, with each having it’s advantages and disadvantages. Here the bottom of the ship is being setup for damage control of incoming water. 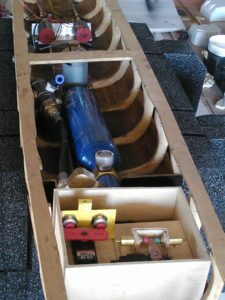 With use of water channeling, the water is routed to a centrally located bilge pump. Here you can see the “direct drive” motors have been installed. The 7oz Co2 tank has also been located just forward of the bilge pump. Then forward of the Co2 setup is the starting of the radio control box. The radio box has the simple and effective push button speed control, which gives you all power forward one way and all power reverse the other. The advantage to the push buttons is that 99% of all combat is done at full power and this will save you a lot of $$$ over buying a variable speed control. You can also see the Clippard push buttons to activate the guns. One will fire the twin forward gun and the other the single gun aft. 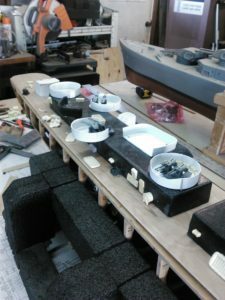 These photos show the vac-u-formed styrene and ABS superstructure before detailing. The lower decks are done in the stronger ABS, because this level is more damage prone than the upper levels. In the stern photo below, you can see that some of the 40mm Quad antiaircraft guns are being fitted. And there you have it for now. 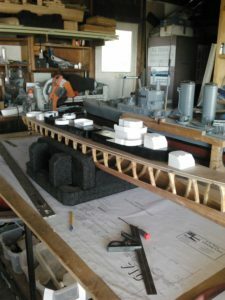 As more photos of the initial construction and completion photos are found, they will be added to this page. So check back often as I have no idea when they will turn up. So with that we will still consider that this page is “Under Construction”.